This is one of those movies that is about an inch deep, but it's still a fun date movie. There is zero thinking required, the ending is absurdly cliche, and what little mystery there is is elementary at best. That said, there is enough suspense and chills to make it fun. Jennifer Lopez is exactly what you have seen before in all of her other movies, not bad, not great. Ryan Guzman plays the lovable psycho well, and Kristin Chenoweth is her usual nails-on-the-chalkboard self. Why anyone casts her in anything I will never understand. It's the kind of movie you'll forget you saw a couple of months from now, but you won't feel like you wasted 90 minutes of your life while watching it. 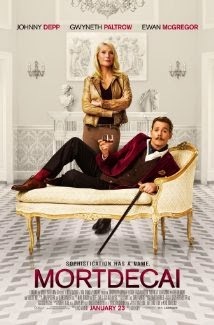 MORTDECAI is a quirky film that is an acquired taste, but if you like quirky films (think THE GRAND BUDAPEST HOTEL) you will love this movie. It is stupidly funny, the story is interesting and the cast is incredible. It took me about 10 minutes to get the right feel and mindset for the film, but once I did I spent the next 90 minutes laughing like a maniac and nearly choking on my popcorn. Johnny Depp is a master of understated physical comedy and is simply a joy to watch. The rest of the cast orbits around him in a beautifully choreographed way allowing each of them to shine, but also let the story be bigger than all of them. Do you remember that amazing film from a few years ago, GNOMEO AND JULIET? Remember how amazing the story was, how innovative the animation was, and how awesome the music was? 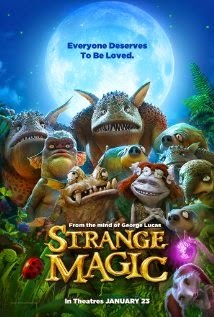 Well, STRANGE MAGIC is exactly like GNOMEO AND JULIET, except it is completely horrible. The animation is truly incredible and beautifully done in this film. Unfortunately, everything else falls flat. The music is weird and forced, the story is too simple and boring, and the things that are supposed to be funny just aren't. Save yourself the money and the anguish and go get GNOMEO AND JULIET to watch with the family this weekend. You'll be much happier for it. Thanks for sharing your honest review, Clint. You’ve presented three different movies from different genres, and you managed to give just criticisms about them. I’ll be reading more of your posts to see other movies you’ve watched, and I’m looking forward to reading more of your fabulous reviews. Have a great day!